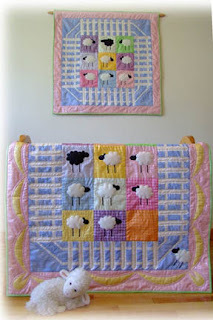 Each year as a member of the Canadian Quilter's Association, I participate in their Trend Tex Challenge. 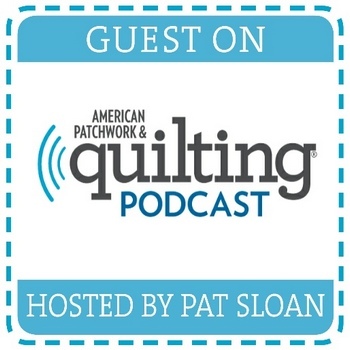 As the upcoming conference will be held in Newfoundland this year the theme chosen for the challenge is Quilts From The Edge. 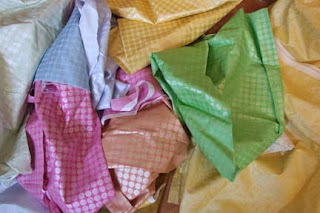 The 5 fabrics are gorgeous marbled pieces and quite intense in their colouring which will produce some rather bold quilts. 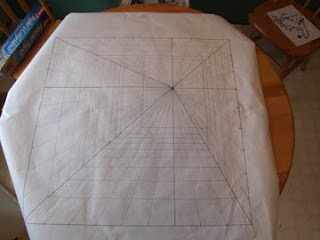 I decided to make a "perspective" piece this year, and began by sketching my design on freezer paper. It's 24" square, so I had to tape two sheets together. 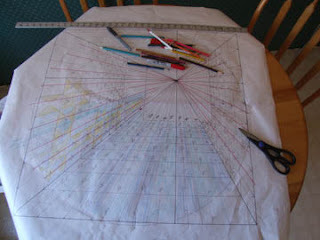 I used coloured pencils to shade in hues to match my fabrics, numbered and labelled each section on the sketch and began the process of cutting up the pattern. 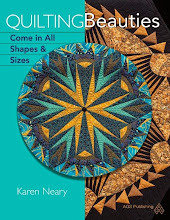 Quilting has never been a hobby for me - always a business. Knitting socks fits the bill of hobby quite nicely, and I love the portability of having a small project with me to work on. It's amazing what can be produced while waiting for kids in Dr.'s or dentist offices, or waiting in the stands for Peter's hockey team to come onto the ice. These recently completed socks are for my 14 year old son whose feet have grown exponentially in the past year. It is no small feat to knit socks for these no small feet! The blue sock on top of the flax is one I made for myself. One sock for this kid is an entire ball of 4-ply Kroy yarn. I often wonder if Zdeno Charo's Mom knitted socks for him! Yan Tan Tethera Click here to order this pattern. Today I am playing with fabrics from the Fairy Frost and Mirror Ball Dot lines from Michael Miller. The hand on this gorgeous fabric is quite unlike anything I've encountered before. The sheen on the pastel shades gives it a dream-like quality. Edit: The pattern for Yan Tan Tethera is now available as an instant download on Craftsy. The date on the last posting says 2006. Holy Cow! It's been a rather hectic year and a half to say the least. I will try to make this more of a priority and get some pictures up asap so you can see what I've been working on. There are lots of surprises in store...so be patient!